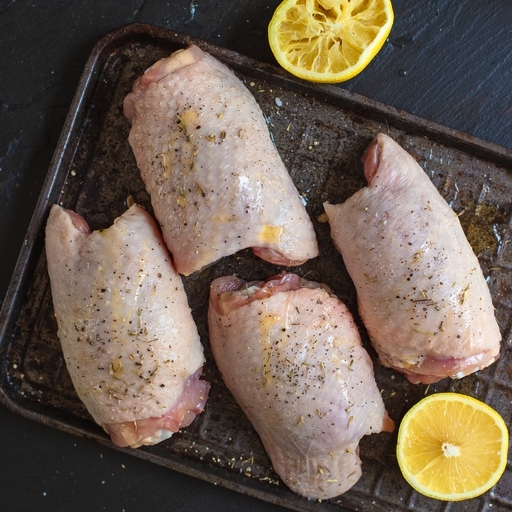 Our juicy organic chicken thighs are quick to cook and stay wonderfully succulent – ideal for frying, poaching, baking or sizzling on the barbeque. It’s hard to beat these birds for taste or welfare: they spend their time grazing freely outdoors, resulting in rich, tender meat that’s full of flavour. Approximately 4 chicken thighs per pack. Thigh meat is arguably tastier than breast meat but requires more cooking time to tenderize. Season, oil and roast at 200˚C/Gas 6 for 15 mins, until the skin has started to colour nicely. Drop the heat to 180˚C/Gas 4 and cook for a further 30 mins, at least. They like a bit of water, wine or stock in the tray to help them along, and are cooked when the meat easily separates from the bone.